This post is dedicated to one of my favorite replacement parents. More specifically, my Monday night chaperones. The best skills I claim to have acquired as an almost infinite single is third-wheeling. It’s kind of like dating, without the hassle of actually having to impress and perfecting your make up. Yes, I have sadly reached the age where most of my friends are happily settled and being single seems to be crime (THERE IS NOTHING WRONG WITH BEING SINGLE!!). So, hanging out with couples becomes inevtable. Lucky for me, I love third-wheeling – especially with these guys, it’s the perfect excuse to hang out with two of my besties. And they both get to hang out with me. How is that not a win-win situation? Over the years I feel I have accumulated couples for all occasions – wining and dining, sports, nights out, movie nights, not to forget drunken madness. Which reminds me, my Monday chaperones have also recently, like good parents, put a roof over my drunken head (now that’s probably only a win situation for me…). For that I am eternally grateful – I would not have made it home alive. Our typical Monday evening entails sweat pants, the one or other youtube video and of course dinner, mostly created from leftover groceries in their fridge, usually resulting in some sort of comfort food. Last week we watched olympics. Now, during the olympics, comfort food is essential – I mean how unsporty and pathetic do those athletes make you feel? It’s like the 5k you just ran to hatch a Pokémon egg (and of course become the next Paula Radcliffe) were not even worth the effort. How is that going to help you towards perfecting the triple back flip screw synchronised diving thing or swinging round the asymmetric bars in gymnastics? And 25m pistol shooting – how is that an olympic discipline?? Anyways, this video of failed Filipino diving will make you feel better. Enjoy it with some red lentil dal. Perfect Monday night. I’m sure you have all heard of kale (if not, go read about it here – haha ok, so not quite the kale I had in mind, but who knew it was also a beautiful boy). If I recall correctly, the hype about this, let’s face it, not so special cabbage, started a couple of years back in Europe. Everyone was crazy about it. Kale chips, kale salad, kale pesto, kale soup, not to forget kale juice, the list goes on. Personally, I never understood the hype. Now, I must admit, it’s probably due to my only kale experience in 2014 being unsatisfying – kale crisps from Pret. The flavour wasn’t right, they weren’t satisfying, and honestly – fried cabbage? – not my thing. In most aspects of life I’m not really one to follow trends, I would say I’m always at least a few trend-generations behind. One of my exes always tried to widen my music-horizon by constantly showing me new songs. I’d listen to them once, label them as terrible, forget them for 6 months, then hear them on the radio, fall in love with them and proudly show my ex the greatest new songs of the month. Classic. And how often did this happen? All the time. After a while he gave up. Understandable. Same story with kale, only here it took me years, not just months. How have I lived without it?? In my opinion, the best use of kale is in a curry. YUMS – so here you go, try it. Time for something savoury, don’t you think? This dish was inspired by my neighbours, a wonderful Japanese and Chinese couple, who are sadly moving very soon. Last week they invited us round for a delicious leaving apéro – my does she know how to cook – I was in Japanese finger food heaven. One of the highlights were the pork panko meatballs. I don’t know what it is about panko, but when it comes to breaded meats – panko breadcrumbs win, 200% of the time. Your good old classic breadcrumbs are lame in comparison. 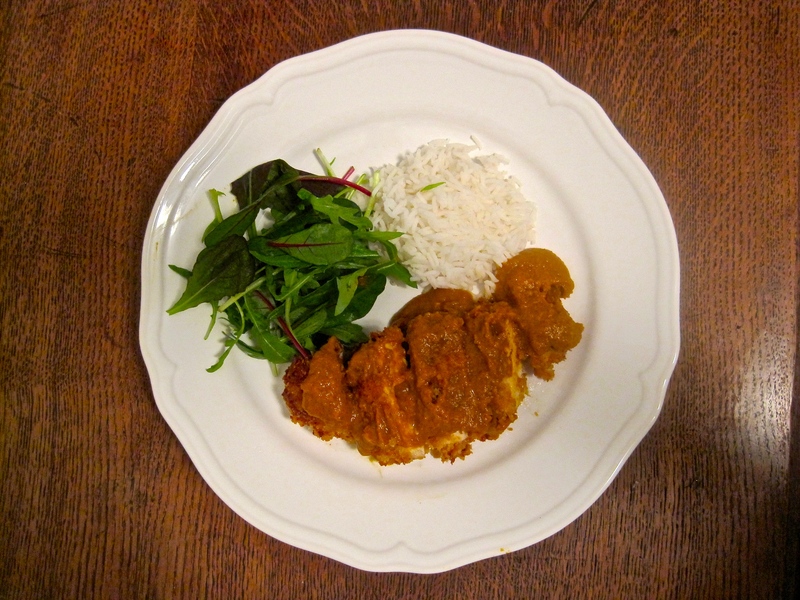 Determined to try make something using the panko breadcrumbs, I ended up attempting a Japanese classic – chicken katsu curry. Not too bad for a first go. Sorry for the picture – definitely not a stunner.